The Favourite is the latest film from Greek director Yorgos Lanthimos. It stars Olivia Colman, Emma Stone, and Rachel Weisz in the leading roles. While it’s flown slightly under the radar due to a limited theater release in the States, it caught my attention when I learned it’s been nominated for ten (count em’ TEN!) Academy Awards. So I checked it out at the wonderful Maple Theater and Kitchen in Bloomfield Hills and came away very pleased. It’s definitely not a film for everyone, but I can definitely now see why The Favourite has managed to make it to the top of many people’s Top Ten Lists of 2018. The film is a Period Piece set in the early 18th Century during Britain’s conflict with France in the War of the Spanish Succession, and focuses on the seedy machinations of the British Royal Court. At the time, Britain was at the time under the rule of the frail and mentally unwell Queen Anne (Olivia Colman), who eschewed governing her country in favor of eccentric celebrations and caring for her 17 rabbits, each of which represented one of her deceased children. At her side is the icy and domineering Sarah Churchill (Rachel Weisz) who serves as the Queen’s advisor, confidante, behind-the-scenes ruler of the country and secret lover. But the plot thickens when Sarah’s impoverished cousin Abigail Hill (Emma Stone) arrives at Court as a scullery maid, begins to rapidly climb the social hierarchy and competes with Sarah for Queen Anne’s favor. In the style of Stanley Kubrick’s own Period Piece Barry Lyndon, deception, betrayal and ruthless politicking quickly ensue. 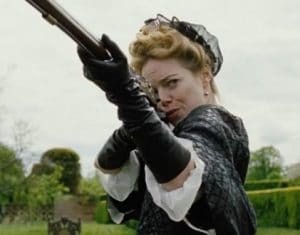 First and foremost, I would not be surprised if any of the three leading ladies of The Favourite ends up taking home Best Actress/Best Supporting Actress awards for their work here. And good thing too, because this movie is all about the performances. All three actresses dominate the screen every time they’re on camera; Olivia Colman plays the unstable Queen Anne with a very dynamic performance, equal parts manic and tragic. Rachel Weisz and Emma Stone have an amazing chemistry, which turns chillingly adversarial as they battle against each other for the Queen’s favor. Complimenting the acting is a visual splendor of great cinematography in the style of Kubrick; lots of perfectly symmetrical shots, moody lighting that makes great use of shadows, and gorgeous set-design. But before we get into whether or not I’d recommend The Favourite, we have to talk about what is obviously going to a point of contention for a lot of people, which is the Director. Yorgos Lanthimos has been making a big splash in recent years with his previous two titles, The Lobster and The Killing of a Sacred Deer. He’s also been the subject of serious contention, due mostly in part to his very stylized and atypical method of directing. If I had to describe Lanthimos in a nutshell, I’d probably call him Wes Anderson’s darker and edgier twin-brother, with a splash of Kubrick’s general air of misanthropy. While the two employ very similar styles (lots of symmetry, elaborate set-design, and deadpan dialogue), the difference between the two is that their films are complete opposites in terms of tone. Anderson’s films are quirky, warm and storybook-like, while everything in Lanthimos’s films feels very cold, dethatched, and clinical. Lanthimos’s dialogue is very mannered and precise, devoid of sentimentality and is usually delivered by his actors in a very flat and emotionless tone of voice that feels very unsettling. Adding to this air of coldness is his characters, who are rarely characterized as sympathetic and interact with each other in ways that are purely transactional in nature. By the end of The Favourite, you’re not exactly sure who to root for, because all of the major characters in the plot have done horrible things in service of their own ambitions. This might be appropriate given the setting and themes, but it can make the film feel rather difficult to watch for some people. Overall, while I enjoyed The Favourite, it’s not a movie I’m in a rush to go see again. It’s what I’d call a “Feel Bad” movie; something you have to be in the right state of mind to enjoy and only if you can accept a very uncompromisingly dark view of human nature. So take this review as a tentative recommendation. class="post-template-default single single-post postid-13705 single-format-standard samba_theme samba_left_nav samba_left_align samba_responsive wpb-js-composer js-comp-ver-5.7 vc_responsive"